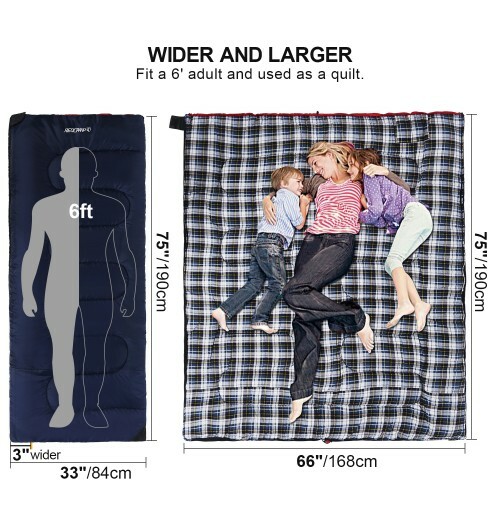 •WIDER AND LARGER: The flannel sleeping bag for adults is 75x33 inches /190x84cm which is 3 inches wider than average sleeping bags and is perfect for people who are 6 feet tall. •EXTRA WARMTH: The cotton lined adult sleeping bag is comfortable for different temperatures and is designed with a 2,3 or 4 lbs filling. 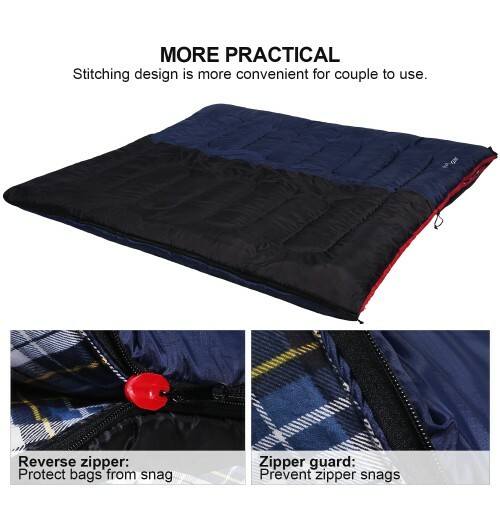 •EXTREMELY PRACTICAL: The flannel sleeping bag has a 2-way zipper with zipper guard which allows you to connect two of our flannel sleeping bags for camping together. •MORE CONVENIENT: Inside the flannel sleeping bag we provide an internal pocket to storage some of your personal belongings. As extra service and to make your sleeping bag easy to carry we include a compression bag for free. 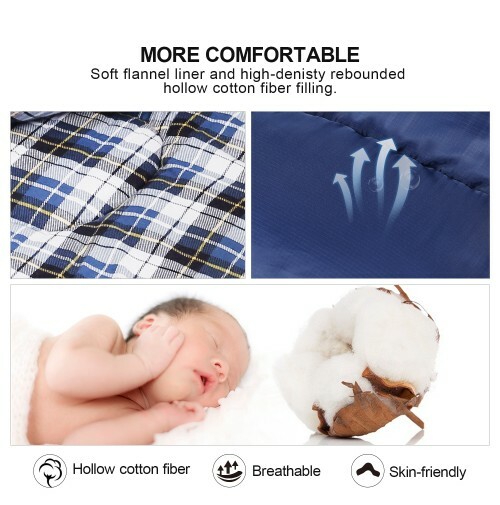 •GET THIS FLANNEL SLEEPING BAG RISK FREE: Your 100% satisfaction has always been our top priority. That is why all of our products are backed by our unconditional 365-day manufacturer warranty. 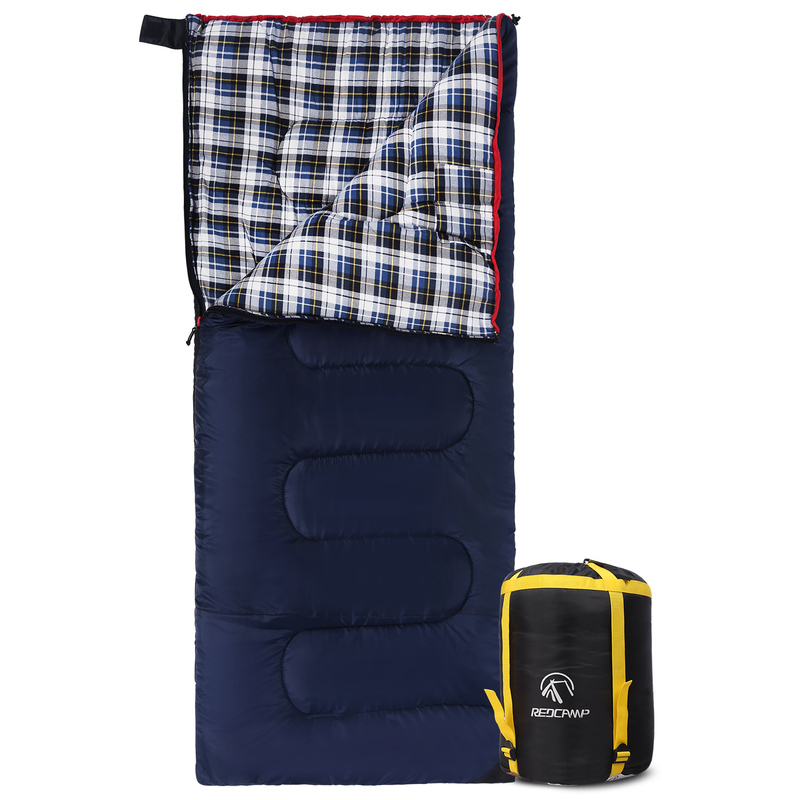 The REDCAMP sleeping bags are great for both in- and outdoor activities. 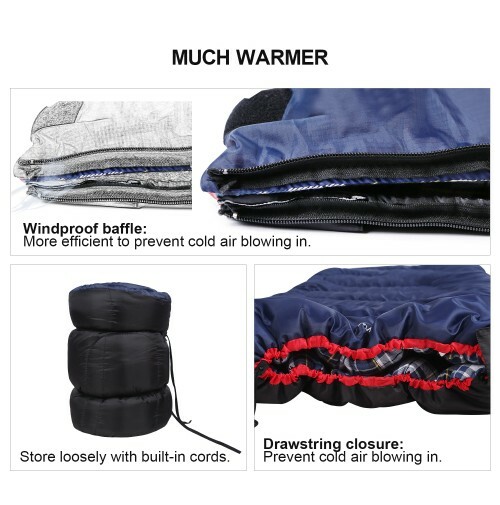 With the compression bag, the sleeping bags are easy to carry and can be used for camping, hiking tours, self-driving tours, fishing and other outdoor activities. So feel free to BUY your own sleeping bag and don’t forget your family and friends! REDCAMP is a professional company that sells outdoor equipment and we design and develop high quality outdoor products for your favorite outdoor experiences in nature. 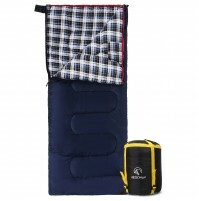 REDCAMP provides three types of sleeping bags that can be used by different temperature conditions. The 2lbs cotton filling is comfortable for temperatures between 50-77°F/10 - 25°C and is designed for spring, summer and autumn. The 3lbs cotton filling is comfortable for temperatures between 41-68°F/5-20 °C and is designed for spring, autumn and winter. And the 4lbs cotton filling is comfortable for temperatures between 32-59°F/0 - 15°C and is designed for spring, autumn and winter. 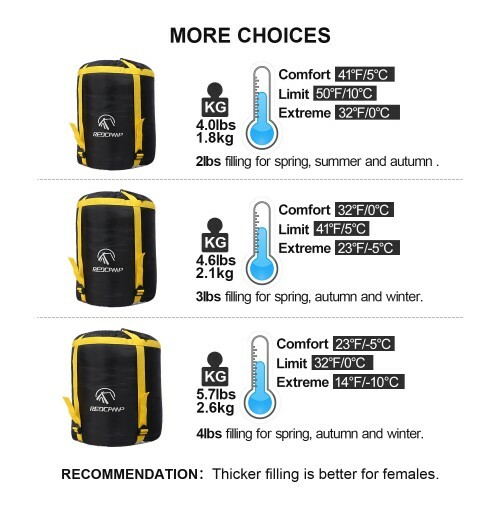 For women we recommend the 3 and 4lbs sleeping bags.